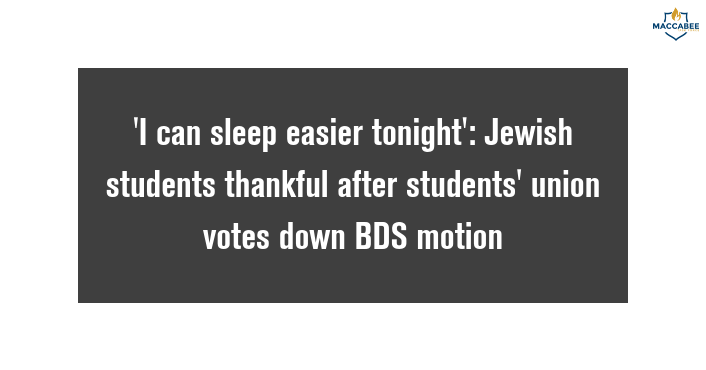 A motion that claimed to “protect Jewish students” while calling for a boycott of Israeli institutions has been defeated at Cardiff University Student Union, with one Jewish student saying she could “sleep easier tonight” as a result. The motion was titled “protecting our Palestinian and Jewish Students” and proposed by one of the SU’s vice presidents and seconded by its president. While stating “the rise of antisemitism is an extremely worrying threat”, it then accused Israel of a “system of occupation and colonialism”, saying “Israeli universities play a key role in Israel’s crimes against the Palestinian people”, and urging support for a boycott. However, Jewish students at the university spoke up against the motion on as it debated on Thursday evening, saying none of them had been consulted about something that purported to be “protecting” them. Guy Oberlander, president of the university’s Jewish Society, tweeted from the conference hall that he “had absolutely no idea” about the motion until he saw the schedule for the SU’s AGM. “Don’t let outside affairs affect the safety and welfare of my friends and family. I am sat here at the moment already nervous,” he said. A second Jewish student pleaded with those at the AGM, tweeting: “Don’t vote for this antisemitic mess of a motion”. Daniel Kosky, campaigns organiser at the Union of Jewish Students (UJS), told the JC the motion was “divisive”, adding it “seemed to define antisemitism for Jewish students, without any consultation with them”. He added: “It played merely lip service to antisemitism and was a blatant attempt to ‘Kosher’ BDS, a movement that the vast majority of Jewish students see as an attack on their identity.